Just like the esteemed XK, time honoured XJ-S, matchless E-Type, and equally revered XK150/140/120 of decades’ past, the F-Type is the heart and soul of today’s Jaguar. For good reason the F-Type has become one of the best-selling sports cars in the premium sector, and likewise it goes without saying that any opportunity afforded me within its cockpit is met with enthusiasm. I was especially excited to get my hands on this 2018 model, as it represents the F-Type’s first-ever mid-cycle refresh. Premium sports cars don’t get made over as often as volume-branded alternatives, this being the fifth model year of its availability, so its changes were welcome even if subtle in application. Nevertheless it’s easy to see the new standard LED headlights that add a premium-level, high-tech appearance and better nighttime visibility no matter the trim, while the front bumper and lower fascia design features new air intakes with horizontal strakes that make the front of the car look wider, instead of the vertical curving elements fronting last year’s model, or at least this is true when comparing my old and new 2017 and 2018 F-Type R Coupe testers. Yes, I reviewed this exact same trim level last year, and I must say there’s considerably more model-to-model differentiation throughout the 2018 F-Type range, with pricier, more potent F-Type trims featuring more aggressive, sportier front fascia designs. That not only helps onlookers distinguish between higher end models, but also allows those who want a classier, more elegant ride to opt for something with a bit more country club flare. Then again no one should complain when pulling up to the club in this F-Type R, or for that matter mock your choice when its darker taillight lenses become evident as the valet drives away. Still, Jaguar’s ability to please varied tastes is important, as not everyone is moved by such brazen masculinity. Hence why the 2018 F-Type is now motivated by the widest array of powerplants in Jaguar sports car history. No less than three engines in six states of tune are available, the new base direct-injected and turbocharged 2.0-litre Ingenium mill marking the brand’s first foray into four-cylinder sports car propulsion since before the aforementioned XK120 went into production in 1948, that being the stillborn 2.0-litre XK100. In other words, this is the first four-cylinder production Jaguar sports car ever. Even the 1935 SS Jaguar 90 and 1936–1940 100 were powered by straight-six engines, but this said no one should concern themselves about performance as the new base engine makes a very healthy 296 horsepower and 295 lb-ft of torque, which when combined with its standard eight-speed Quickshift automatic transmission results in a very spirited 5.7-second sprint to 100km/h before attaining a limited top speed of 250 km/h. The turbo-four should provide more than enough performance for plenty of sports car enthusiasts, as it easily beats or matches its closest mid-range premium competitors. What’s more, aided by standard auto engine start/stop the thriftiest 2018 F-Type gets a city/highway combined Transport Canada rating of 9.2 L/100km, which stacks up well against challengers too. Additionally, the F-Type either matches or beats its key rivals when powered by one of its more formidable supercharged V6 or V8 engines, the new for 2018 F-Type 400 Sport special edition capable of 400 horsepower and a 4.9-second sprint to 100km/h, and the top-tier F-Type SVR putting a cool 575 horsepower down to all four wheels for a 3.7-second dash to 100km/h, but more importantly the F-Type’s new $68,500 starting point, which is $10k less than last year’s base Coupe, makes it more affordable than the majority of competitors when they’re upgraded to match the Jag’s standard features. From its most basic namesake form to its most awe-inspiring SVR designation, Jaguar has a full range of F-Type trims capable of going head-to-head with almost any sports car currently available, which is a highly efficient way of taking on larger, less exclusive brands and simultaneously delivering big value to its clientele. Driving the value equation higher at the lower end, yet easily keeping up to and even surpassing many of its pricier rivals as trim levels rise, the F-Type delivers handcrafted, bespoke-like interior finishings that would make any hailer of Britannia proud. The cabin of my F-Type R was once again filled with beautiful soft leather surfacing, highlighted by lovely contrast white stitching for a sporty look. Even the dash-top, centre stack surround and door uppers benefited from the upscale treatment, this matching the centre and side armrests as well as the seat bolsters. Piano black lacquered hardwood tastefully graced the instrument panel, console and other key areas, while beautifully detailed aluminum brightened all-round. Some of those surface treatments are new, and truly give the car a more exotic ambience, while even those purchasing an entry-level F-Type should be pleased to hear the brand’s 8.0-inch InControl Touch Pro infotainment system is now standard, its large screen, faster processing speeds and tablet-style tap, pinch and swipe gesture controls making most in-car functions work smoother, while those just noted seats are of Jaguar’s new slimline design, featuring pressure diecast magnesium alloy frames that reduce their weight by 7.7 kilos, and improve ergonomics for a more comfortable fit. I couldn’t find fault with last year’s seats, but must admit these new ones are superb. Part of the F-Type’s value equation comes down to everything you get for your money, a shortlist of standard features including LED headlights, 18-inch alloys, proximity keyless access, pushbutton ignition, power-folding heatable side mirrors with memory, rain-sensing wipers, an auto-dimming rearview mirror, a power-adjustable steering column with memory, 12-way powered sport seats with memory, leather and Suedecloth upholstery, auto climate control, a rearview camera, navigation, InControl apps, Pro Services, 380-watt 10-speaker Meridian audio, satellite and HD radio, rear parking sensors, lane departure warning, and more. My F-Type tester was upgraded with a $1,530 Climate package that adds another zone to the standard automatic HVAC system, plus heated seats, a heatable steering wheel and heated windshield, plus it also included a $260 universal garage door opener and $260 auto high beams, while its $870 Drive Pack featuring lane keep assist, blindspot monitoring with rear cross-traffic alert, traffic sign recognition, adaptive cruise control, and a driver condition monitor once again represents excellent value. Of note, Jaguar offers a number of other option groups such as a $1,180 Black package that replaces chrome and body-colour exterior elements with glossy black, a $1,130 Interior Black package that adds a flat-bottom sport steering wheel with black spokes, gloss black instrument cluster dial rings, and black vent surrounds, a $2,250 Extended Leather Package that adds leather-clad sunvisors and a leather headliner (the stitched leather dash top and instrument panel others charge you more for is already standard), $1,020 770-watt 12-speaker Meridian surround audio, $210 auto-dimming side mirrors, a $510 powered liftgate, $290 front parking sensors, and more. The larger 380-mm front and 376-mm rear rotors and red brake caliper upgrade comes standard in F-Type R trim, although if red’s not your thing you can change them to black, while you can also get yellow calipers that clamp down on even larger 398-mm front and 380-mm rear carbon ceramic discs, which also includes a unique set of forged black alloys for $13,260, although my car’s carbon-fibre and satin dark grey diamond-turned 20-inch alloys were $2,550 extra and stunning, especially when matched to Corris Grey paintwork. I could go on, but it’s probably best to let you configure your F-Type as you see fit. Like the rest of the cabin, the F-Type’s switchgear is exquisitely crafted and made from the best quality composites and metals. The three-dial dual-zone auto HVAC interface is downright gorgeous and works flawlessly, while the row of toggles just underneath pay tribute to Jaguars of yore. An ignition button is nothing new these days, but press it and you’ll enjoy the staged choreography of air vents powering upward from their otherwise flush settings. On that note, the F-Type is one of just two Jaguars to use a traditional shift lever, which makes it nicely suited to performance enthusiasts who’d rather put their entire arm into swapping cogs, while placed right beside is a wonderful bit of automotive kit, the F-Type’s sharply angled drive mode rocker switch. Pull it back toward the checkered flag and it immediately engages Dynamic sport mode as well as the standard active sport exhaust system. So set, all systems are ready for optimal performance, and the sound emanating from the tailpipes intoxicates the auditory cortex. A quick blip of the throttle provides a chainsaw-through-metal-like rasp, the kind of sound that causes car people to rubberneck as you pass by, and then when getting hard on the throttle and letting the revs soar, the supercharged V8 produces a soundtrack like few others. The numbers read 550 horsepower at 6,500 rpm and 502 lb-ft of torque from 2,500 to 5,500 rpm, while power goes down to all four wheels via a lickety-split shifting performance-tuned eight-speed Quickshift automatic with aluminum paddles. It’s the stuff of supercars, albeit in a much more refined, easier-to-drive package. That means tooling around town won’t wear you out. Instead, the F-Type’s relatively upright stance and good outward visibility make it a joy to drive no matter the traffic conditions, while the suspension setup is ideally suited to the patchwork pavement of inner-city streets and alleys plus the mixture of smooth highways and crumbling back road byways of suburbia and outlying rural areas. 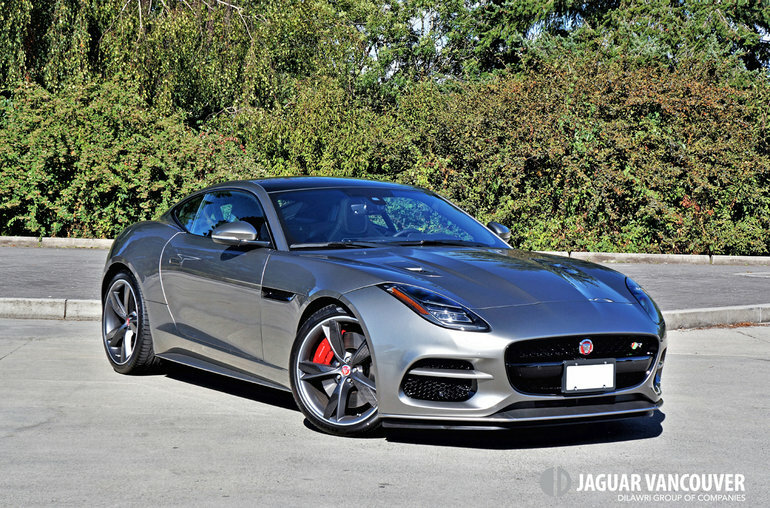 The F-Type’s impressive ride quality can partially be attributed to its ultra-rigid bonded and riveted aluminum framework and body panels, this stiff structure allowing greater wheel travel together with a more compliant suspension setup, while its at-the-limit handling capability doesn’t suffer one iota. It’s brilliant fun no matter the road below, whether zigging through sharply carved S-turns or zagging around long, fast, sweeping highway benders, its standard brake-sourced torque vectoring control no doubt coming into play as well. Rest assured that the F-Type’s stiff structure also enhances crash worthiness, while reducing noise, vibration and harshness levels so as to enjoy the delectable sound of the exhaust more easily, or for that matter one of its superb audio systems. Before I do you a disservice and leave you wondering whether the F-Type can or can’t be had with a classic six-speed manual, take heart that 340 and 380 horsepower versions of its supercharged V6 can indeed be purchased with a DIY gearbox mated to RWD. You can also get the eight-speed auto with this setup, but take note AWD can only be had with the 380 horsepower engine. Of note, the base four-cylinder comes exclusively with the eight-speed auto and RWD setup. As for the new Sport 400, it’s automatic-only and mates to either RWD or AWD, and the top-line SVR is configured just like my R tester, with an auto and AWD, while those not as comfortable backing up as going forward can order their automatic-equipped F-Type with semi-autonomous self-parking. Lastly, all of the above configurations can be had in two-door Coupe or Convertible body styles. With the renewed 2018 F-Type, Jaguar has covered all bases, and done so brilliantly. In fact, it’s become one of the most multi-dimensional sports cars available, and one of the best.